Taxes on voice, SMS and data were imposed by the Benin government on the 19th of September 2018. Following mass outcry, the taxes were withdrawn by the President on the 24th of September 2018. The price of a basket of 30 calls and 100 SMS’ has declined since Q1 2011. The price for a 1GB basket has declined since Q3 2014. While prices in Benin have been declining, other countries have shown greater reductions in price. In terms of 1GB of data, Benin ranks 32 out of 51 (Table 1). If the tax was implemented, Benin’s rank would drop to 49 out of 51 countries, the third most expensive country in Africa. 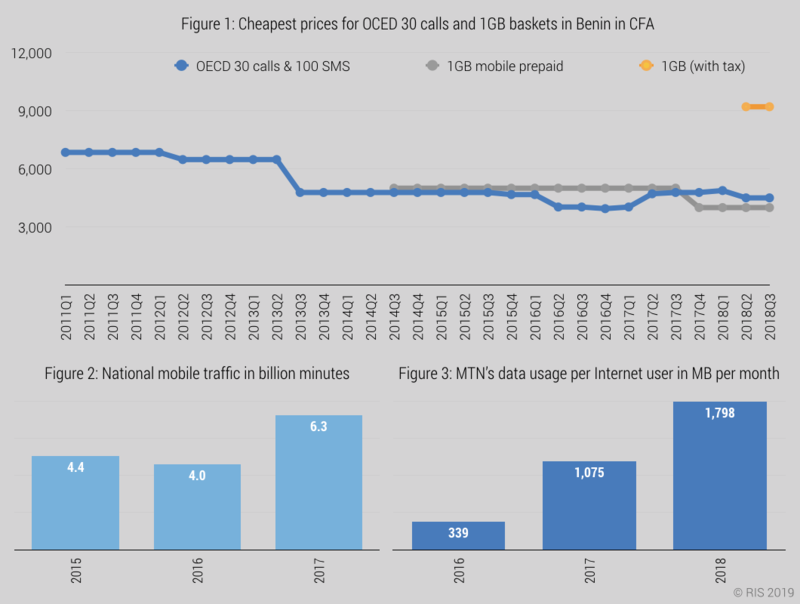 Comparing the OECD basket of 30 calls and 100 SMS’, Benin ranks is at rank 35 out of 51 (Table 2). If the tax had been implemented, Benin’s ranking would have been 38th. Between 2015 and 2017, data prices for MTN dropped and subscriber numbers increased. Moov saw similar changes, though not as pronounced because their price decreases were not as significant (Table 3). Libercom, Glo Mobile and BBC were excluded because they ceased operations in 2017. Price decreases combined with increases in subscriber numbers show increases in mobile voice minutes as well as data usage (Figure 2). These increases are inconsistent with the statement that OTTs are to blame for falling revenues. Clearly, any fall in revenue must have been caused by a decrease in price and not a decline in outgoing minutes. Similarly, data usage increased between 2016 and 2018 (based on MTN annual financial statements). Strong data growth as a result of lower prices indicates a high price elasticity. This also implies that additional taxes on data that makes the price much more expensive will result in significantly lower usage. Benin’s mobile population coverage is on the higher end compared to neighbouring countries (Table 5). Investment has also remained relatively constant (Table 4). Market concentration in 2017 was high in terms of both subscribers and mobile operator revenues (Table 6). 2017 was a tumultuous year in the ICT sector in Benin. 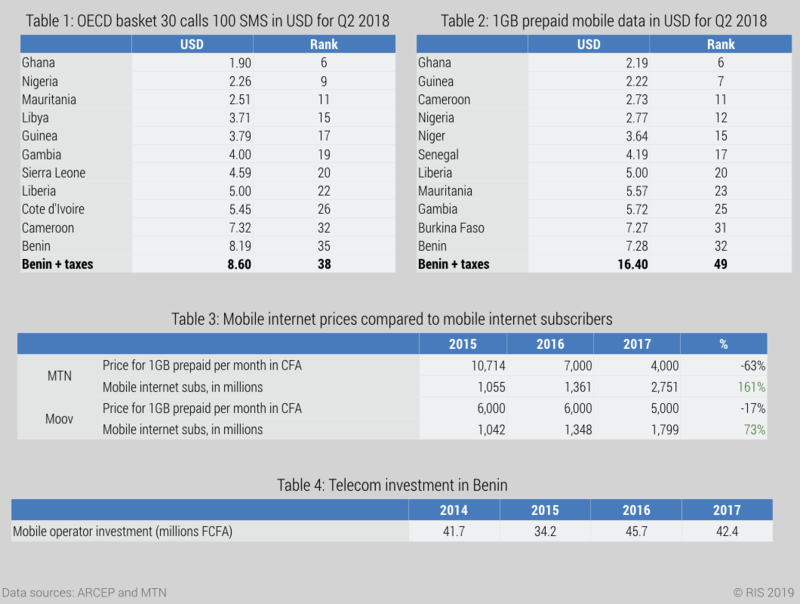 At the beginning of 2017, Benin had 5 GSM operators. 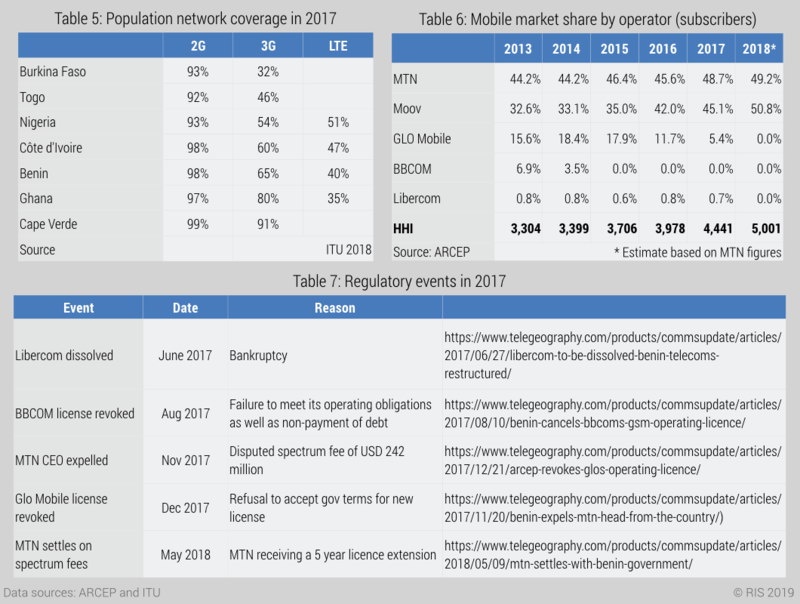 By the end of 2017, there were only 2 GSM operators: Moov and MTN (Table 7). In May 2018, Benin settled with MTN on spectrum fees. MTN agreed to pay the fees in instalments, receiving a 5 year extension to its license as well as the license to install fibre. The market is dominated by MTN, which had a market share of 58% of revenues in 2017. MTN’s subscribers have continuously increased over the last five years. With increasing subscriber numbers, ARPU typically declines as less affluent segments of the population join the network. The ARPU drop in 2017 is steeper than what one would typically expect. Revenues declined in 2017 in FCFA, estimated based on local currency APRU multiplied by subscribers (source: MTN investor relations. Also 2017 ARPU has not been restated for the impacts of IFRS 15 and modernisation of subscribers). The steadily growing subscriber numbers is consistent with the price decreases in both voice and SMS and data, established in the previous section. The explanation for the drop in revenues is that there was a price war in 2017 and the decrease in revenues from existing subscribers was greater than the additional revenue earned from new subscribers. From Q4 2017 until Q3 2018, MTN revenues grew again. Regulatory intervention affected MTN’s EBITDA margins. 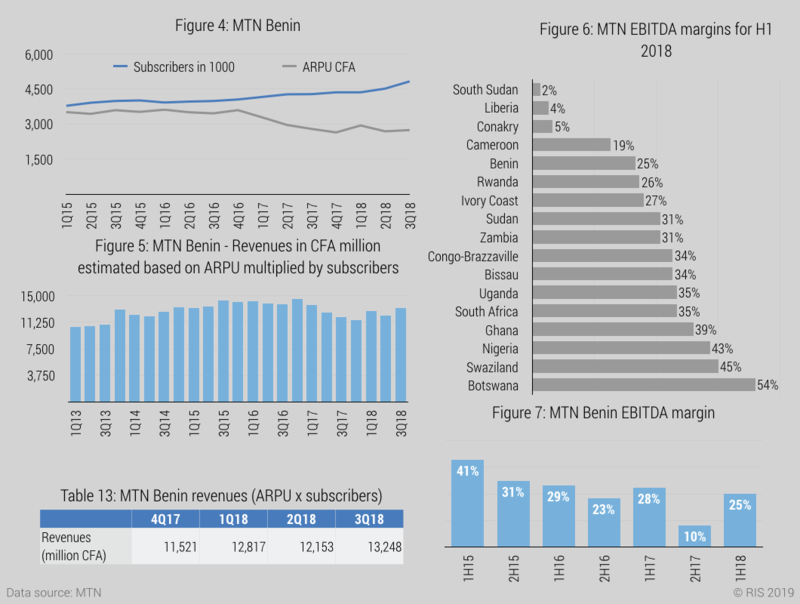 MTN Benin’s EBITDA margin is considerably lower than those of MTN Ghana and MTN Nigeria, where MTN is also dominant but competes with more operators. The drop in EBITDA margin in H2 2017 was caused by the USD 242 million that was set aside for the spectrum penalty that ARCEP imposed on MTN. The dispute was resolved in Q2 2018.. The Executive Secretary of ARCEP was the guest of the Sunday program "Zone Franche" on Canal 3 on September 2, 2018. In the interview, the Secretary stated that “between 2016 and 2018, operators lost around 30 billion of turnover due to the invasion of OTTs, which do not contribute to the turnover of the operators they use, infrastructure or national tax revenues”. The analysis of Benin’s sector performance shows that this statement is misleading. During the period 2016 to 2018, traffic on the network increased, prices declined and mobile internet subscribers increased. None of these events are consistent with the interpretation that OTTs cause a 30% decline in MNO revenues. It is far more likely that regulatory intervention in the market caused the decline in revenue, especially the removal of three licensees from the market during 2017. MTN’s ARPUs and subscribers have increased after 2017. Regulatory intervention in the market caused the decline in mobile operator revenues, especially the removal of three licensees from the market during 2017. ARPUs and subscribers have increased after 2017.